The Nassau Inter-County Express, or NICE Bus, has suspended service on several routes because of the snow, including on the N21, N23, N27, N28, N57, N47, N20 between the Great Neck and Hicksville LIRR stations, and on the N49 shuttles. Several other routes are experiencing delays and detours and all Able-Ride trips that have not begun will be canceled. The westbound Long Island Expressway lanes between exits 34 and 36 reopened at about 11:30 a.m. Thursday, state Department of Transportation officials said. They were closed because of multiple accidents at about 9:45 a.m., officials said. Southwest and American airlines began canceling their flights into and out of Long Island MacArthur Airport on Wednesday night ahead of the snowstorm, said airport Commissioner Shelley LaRose-Arken. But the Ronkonkoma airport remains open Thursday and has had some traffic from general aviation aircraft, she said. "We're just removing lots of snow," she said, noting that as of 11 a.m. the airport had received 6 inches of snow. "It's going to be a long afternoon." Southwest Airlines has tentatively planned to resume its flights into and out of LIMA at about 10 p.m. Thursday, depending on conditions, LaRose-Arken said. Passengers are advised to check with the carrier before heading to the airport. Newsday is tracking as much as 10 inches of snow in some parts of Long Island. See how much snow is in your neighborhood on Newsday's live snow totals map here. Riverhead Town Supervisor Sean Walter said motorists who refuse to stay off the roads during the snowstorm are presenting unnecessary challenges for emergency personnel. Walter said emergency workers in Riverhead have had to pull people out of snowbanks who were out just to sightsee. Suffolk County Executive Steve Bellone declared a State of Emergency in Suffolk County, effective at 11 a.m. The decision was made due to emergency conditions produced by the storm, officials said in a statement. Gary Peters and his wife, Nancy Peters, both of Port Washington, said their drive to work in Roslyn was very “treacherous” and that there was hardly a car to be seen. But snow was no deterrent for the demands of their day jobs as divorce attorneys at “Peters and Peters” in the Harbourview Shoppes in Roslyn, Gary Peters said. “Neither snow nor inclement weather can obstruct liberating unhappy spouses,” Peters said. The Federal Aviation Administration issued a ground stop Thursday morning for Kennedy Airport because of snow and ice. A ground stop means flights that are destined to the affected airport are held at their departure point for the duration of the ground stop, according to the FAA. At a news conference Thursday in Bethpage, Nassau County Executive Edward Mangano said area roads were "treacherous" and encouraged motorists to stay home. 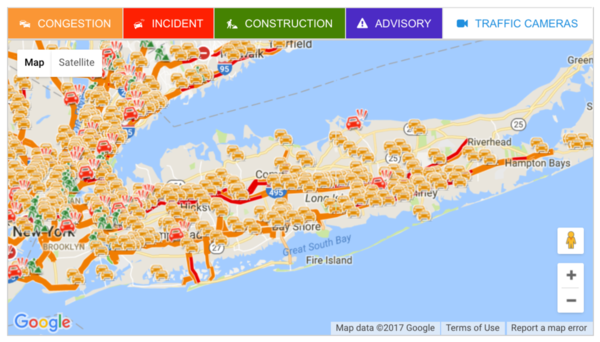 As of 10 a.m., the Nassau County police have responded to 19 accidents, although he concedes the number is higher if you include spinouts and motorists in need of assistance. There have been no reported injuries, he said. "If you don't need to be on the roadway please don't take to the roadway," Mangano said. "It's obviously treacherous conditions. With the visibility problem you can get yourself into much more serious trouble." The most serious incident, Mangano said, involves a jackknifed tractor trailer and several other vehicles westbound on the Long Island Expressway. The LIE has been shut down near Exit 33, adding that there has been no discussion with state officials yet about shutting down the expressway, Mangano said. In another unusual incident, a Nassau police ambulance, idling in front of the Island Park Fire Department, caught fire shortly before 9 a.m. Thursday. There was no one in vehicle, a 2015 Chevy Braun, at the time of the fire. Fire Department officials put out the blaze and the police Arson Squad was investigating, Deputy Police Chief Patrick Ryder said. Nassau's bus system is continuing to operate with limited service, he said. Nassau residents with nonemergency issues, such as down trees and stranded motorists, are encouraged to call 800-315-5153. Brookhaven Town declared a state of emergency Thursday, barring nonemergency vehicles from roads so that plows can sweep snow from town streets. A Brookhaven Town Board meeting scheduled for 5 p.m. Thursday was postponed to 2 p.m. Friday. On Thursday morning, most businesses on Roslyn’s main stretch, Old Northern Boulevard, were closed. One exception was Delicacies Gourmet. Jim Zanfardino, who owns the Roslyn-based deli, has kept it open during every major storm for the past 27 years. He said that residents expect the business to be open, despite the heavy snowfall. “It’s kind of a sanctuary, people trickle in here around noon,” Zanfardino said. It’s nice to stay inside with a nice cup of hot chocolate or a hot toddy on a snowy day, but the reality is that many people have to venture outside to push the snowblower around. The machines can be easier and quicker to use than the old-fashioned shovel, but snowblowers can present problems of their own. • Never stick your hands in the snowblower. If snow jams the snowblower, stop the engine and wait more than 5 seconds. Use a solid object to clear wet snow or debris from the chute. Beware of the recoil of the motor and blades after the machine has been turned off. • Make sure there’s proper supervision. Do not leave the snowblower unattended when it is running. Shut off the engine if you must walk away from the machine. • Safely fuel the machine. Add fuel before starting the snowblower. Never add fuel when the engine is running or hot. Do not operate the machine in an enclosed area. • Stay away from the engine, which can become very hot and burn unprotected flesh. • Watch the snowblower cord. If you are operating an electric snow blower, be aware of where the power cord is at all times. • Do not tamper with the machine. Do not remove safety devices, shields or guards on switches; and keep hands and feet away from moving parts. • Watch for motor recoil. Beware of the brief recoil of motor and blades that occurs after the machine has been turned off. • Keep children away. Never let children operate snowblowers. Keep children 15 years of age and younger away when snowblowers are in use. • Understand your machine. Read the instruction manual before using a snowblower. Be familiar with the specific safety hazards and unfamiliar features. Do not attempt to repair or maintain the snowblower without reading the instruction manual. Suffolk County Water Authority chief executive Jeff Szabo said water main breaks haven’t become a problem yet, but calls may start coming in over the next couple of days once the weather gets warmer and the snow starts to melt. “Snow acts as an insulator, so typically we have main breaks [reported]) as the temperature begins to rise and the snow begins to evaporate – then people will start calling in because they’re more visible,” Szabo said. Check travel conditions and live traffic cameras on Newsday's live map here. In the Town of Huntington, Highway Superintendent Pete Gunther said since about 4:30 a.m. Thursday, his team was assembled and working. He has almost 400 vehicles on the road to clear streets, intersections and courts including plows, payloaders and other vehicles. He said the roads were very slippery, with whiteout conditions. He said the biggest problem is people parking on the street, creating hazards for snowplow drivers. He asked that people stay off the roads and not park in the street. Huntington Town Hall was closed Thursday because of the storm. Five or 6 inches of snow had fallen on Babylon Town by 10 a.m., according to Babylon Town spokesman Kevin Bonner. “We entered the heaviest portion of the storm about an hour ago,” he said, describing a high rate of snowfall and near-whiteout conditions. Bonner said that about 115 plows were out clearing town roads and would continue to do so throughout the day. A further deterioration of conditions might hinder even the plow drivers in their efforts to keep roads clear, said Bonner, who urged residents to stay off the roads. “If plows are having a tough time out there, I definitely wouldn’t venture out,” he said. Programs at the town’s senior center have been canceled for the day, but the center itself is still open, Bonner said, as are all other town facilities. Lindenhurst Village Hall is closed for business because of the storm, according to Village Clerk-Treasurer Shawn Cullinane. Some village employees were at the hall to answer resident’s phone calls, he said. The Lindenhurst Community Center was closed today as well, he said. Hempstead Town Supervisor Anthony Santino said crews put down a new beet juice brine along South Shore roads on Wednesday ahead of the storm. The western part of the town seemed to be hit with more snow Thursday morning, he said. Visibility was low and roads were slippery. Most residents seemed to stay off the roads, he said, noting that school cancellations helped that. A robocall in Lynbrook is asking residents to stay off the roads. Trash pickup was also moved from Thursday to Friday, he said. Residents were urged to keep their parked cars off the streets. “They were very compliant,” Mayor William Hendrick said. Crews have been out for hours plowing major roads and were beginning to clear side streets shortly before 10 a.m., he said. In Southold Town, about 2 to 3 inches of snow has accumulated, according to the town’s Deputy Superintendent Roger Tabor. In Montauk, there is currently “no sign of snow,” East Hampton Town Highway Superintendent Steve Lynch said. “It’s 38 degrees and it’s not raining or doing anything. The sky is dark,” Lynch said by phone at 9:30 a.m. Thursday. There is slush in other parts of East Hampton, which declared a snow emergency at 8 a.m. to prohibit street parking, Lynch said. The Highway Department has prepped town roads with salt. All lanes of the westbound Long Island Expressway were closed about 9:45 a.m. between Exits 33 and 36 for multiple crashes, according to the state Department of Transportation and Nassau County police. Approximately 3 inches of snow has accumulated in Riverhead as of 9:24 a.m., said Riverhead Deputy Highway Superintendent Mike Zaleski. Highway personnel have sanded and salted all roads, Zaleski said. Southampton Town Highway Superintendent Alex Gregor said there hasn’t yet been enough snow accumulation for his crew to start plowing because of a buildup of sleet. “We’re happy that so far we’re not seeing the numbers that the National Weather Service said. Right now, we’re lucky if we have an inch of snow so far,” Gregor said. He warned that the sleet, which began early Thursday, made roads especially slick but that he has not heard of any major road accidents. Gregor said he will ask the town supervisor to declare a snow emergency if there is 6 inches of accumulation because that would allow the town to plow private roads. In the meantime, the Highway Department has applied salt to all roads in the town. Town Hall and other facilities closed are closed.